Price Chopper: Chex Cereal, Cheerios And Cinnamon Toast Crunch FREE + $0.54 Profit! 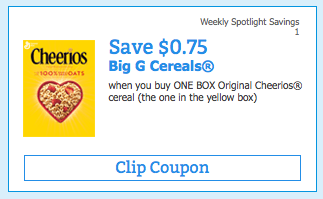 Update: there is a new $0.75/1 Cheerios for this deal as well! So you could add the Cheerios coupon into the deal below and it's still FREE + profit as long as you buy at least one Cinnamon Toast Crunch so you can use the $0.50/ 1 Cinnamon Toast Crunch saving star ecoupon. = 4 FREE + $0.54 profit! plus use saving star ecoupon and pay only $0.23 each! pillsbury and betty crocker sites dont appear to be working for printing.